Was it handled properly, or did the administration look the other way? It just doesn’t seem to stop. Day after day, week after week, months go by and already a year has passed, and the acrimony and controversy surrounding this president, whether ill-conceived by his detractors or self-inflicted by his own behavior and character traits, is a daily ongoing American drama that the world tunes into. The latest episode in the American drama involves a Trump administration staff secretary, domestic violence, and what to do. So what do you do, when you’re confronted with a situation where an individual’s troubled past personal life conflicts with his or her exceptional job performance? To begin with, perpetrators of domestic violence are cowards and deserve the severest of punishment under the law, even a Rhodes Scholar and vital asset like Rob Porter, if in fact he is guilty. However, the intense criticism of President Trump by his detractors for his misplaced and insensitive comments regarding abuse allegations, I believe are extreme and created more out of an opportunity to bash the president and accuse him of deliberately shielding Porter and hiding the truth from the people about these serious allegations. I doubt whether the media, Democrats and the anti-Trump crowd could care less about the abuse victims. Mr. Trump’s tweet read “People’s lives are being shattered and destroyed by mere allegation. Some are true and some false. Some are old, some are new. There is no recovery for someone falsely accused, life and career are gone. Is there no such thing any longer as Due Process?” Is there anything wrong with this statement that would under any other circumstance be considered inaccurate or questionable? Are we not all innocent until proven guilty under the law? Apparently the fact that the president neglected or was unresponsive, whether intentionally or not, to excoriate Rob Porter the accused abuser, and not mention and show some sensitivity toward the abused, Porter's ex-wives, was considered by most of the mainstream media as unethical and typical of his unrefined and coarse sensibilities. One tabloid in its editorial felt the president’s remarks were cause for this statement - “...it freshly wounds the American conscience.” This particular news source has an ongoing daily agenda, since Mr. Trump entered the race for president, of insulting, hostile, and inflammatory rhetoric toward this president - talk about wounding the American conscience every day. But it is not only the president that has come under fire. Chief of Staff General John Kelly, like the president, prior to the photos of Porter’s first wife showing a swollen eye apparently at the hands of her then-husband, had only praise and commendation for Porter while he was a member of the administration. Just for the record, Porter insists the injury depicted in the photos reflect what he calls an accident, there was no malice involved. 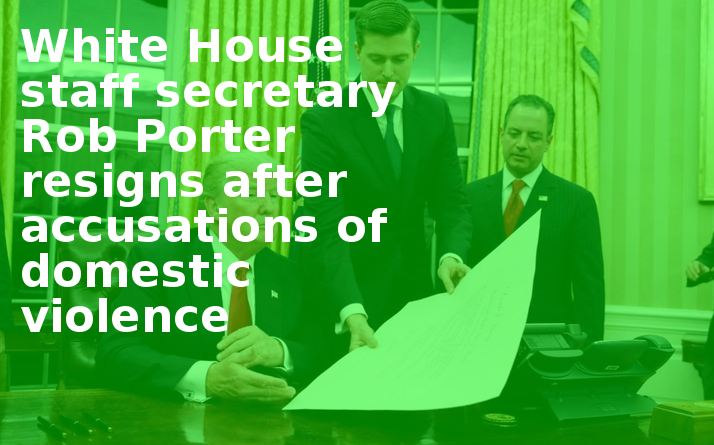 There is some question as to when the president and chief of staff were first informed by the FBI of the abuse allegations against Porter. Their detractors insist they knew back in 2017 but decided not to act until the photos that recently surfaced. At a press briefing on Tuesday, press secretary Sarah Huckabee Sanders explained how FBI Director Christopher Wray’s testimony before the Senate Intelligence Committee, on Mr. Porter, was not at odds with statements that had been made by the White House. Mr. Wray stated to the Committee that the FBI had opened a background check for security clearance purposes into Porter in July 2017 and concluded the process in January 2018. Putting aside all sanctimonious blather and accusations by the press and media, you can decide for yourself whether the administration handled this properly, or mishandled it, and looked the other way and delayed the truth. But keep in mind that the president’s detractors are constantly looking for a scandal every which way possible, and will go to any length, casting aspersions, and reporting information that has no basis in fact; it's fake news, and all this to tear down and embarrass Mr. Trump, and hopefully try to run him out of office.